Since Boston University’s 2016 sale of 310,000 square feet of commercial space in Kenmore Square to Boston-area developer Related Beal, LLC, students in East Campus have already felt the loss of a City Convenience location — and soon will lose the BU Barnes and Noble. The area’s redevelopment will include demolishing several buildings on the north side of the square to create new and renovated office and retail space. Construction of a 300-feet tall luxury hotel and plaza was proposed on Jan 29. 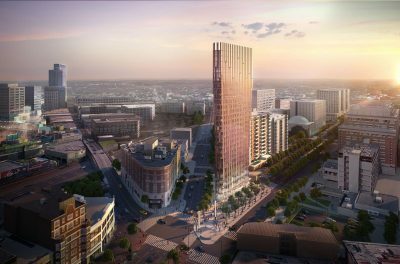 The hotel, proposed by property developer Robert Korff, would be built on the Citizens Bank site that Korff owns at the intersection of Commonwealth Avenue and Beacon Street. BU spokesperson Colin Riley wrote in an email that Kenmore Square is “the gateway to BU’s campus” and that the university supports new development. “We support development that brings vitality, improved safety and other enhancements to Kenmore Square,” Riley wrote. He added that the university will be able to comment more once the proposed developments go through the public approval process. Laura Delgado, an adjunct professor of urban planning in BU’s Metropolitan College, said Kenmore Square has a large population of lower-income residents, including students. As there are already two hotels in the area, she said, there are other types of development that could better serve the local community. “It would be much more important to put housing in than a hotel, and also maybe more institutions that can help the community overall and not just people who are visiting the area,” she said. Arnold Armas, a junior in the College of Arts and Sciences, currently resides in the brownstones in East Campus and regularly walks past Kenmore Square. He said he is looking forward to the redevelopments. Morgan Sutton, a CAS sophomore, lives in South Campus and said that she has heard about the proposed changes on social media. Tian Yang Ji, a freshman in the College of General Studies, said that he does not know if the renovations will be completed in time for him to enjoy the changes before he graduates. Ji added that he thinks building new luxury housing and hotels would be a detriment to people already living in the area.